Distributed data modeling refers to choosing how to distribute information across nodes in a multi-machine database cluster and query it efficiently. There are common use cases for a distributed database with well understood design tradeoffs. It will be helpful for you to identify whether your application falls into one of these categories in order to know what features and performance to expect. Citus uses a column in each table to determine how to allocate its rows among the available shards. In particular, as data is loaded into the table, Citus uses the distribution column as a hash key to allocate each row to a shard. The database administrator picks the distribution column of each table. Thus the main task in distributed data modeling is choosing the best division of tables and their distribution columns to fit the queries required by an application. As explained in When to Use Citus, there are two common use cases for Citus. The first is building a multi-tenant application. This use case works best for B2B applications that serve other companies, accounts, or organizations. For example, this application could be a website which hosts store-fronts for other businesses, a digital marketing solution, or a sales automation tool. Applications like these want to continue scaling whether they have hundreds or thousands of tenants. (Horizontal scaling with the multi-tenant architecture imposes no hard tenant limit.) Additionally, Citus’ sharding allows individual nodes to house more than one tenant which improves hardware utilization. The multi-tenant model as implemented in Citus allows applications to scale with minimal changes. This data model provides the performance characteristics of relational databases at scale. It also provides familiar benefits that come with relational databases, such as transactions, constraints, and joins. Once you follow the multi-tenant data model, it is easy to adjust a changing application while staying performant. Citus stores your data within the same relational database, so you can easily change your table schema by creating indices or adding new columns. There are characteristics to look for in queries and schemas to determine whether the multi-tenant data model is appropriate. Typical queries in this model relate to a single tenant rather than joining information across tenants. This includes OLTP workloads for serving web clients, and OLAP workloads that serve per-tenant analytical queries. 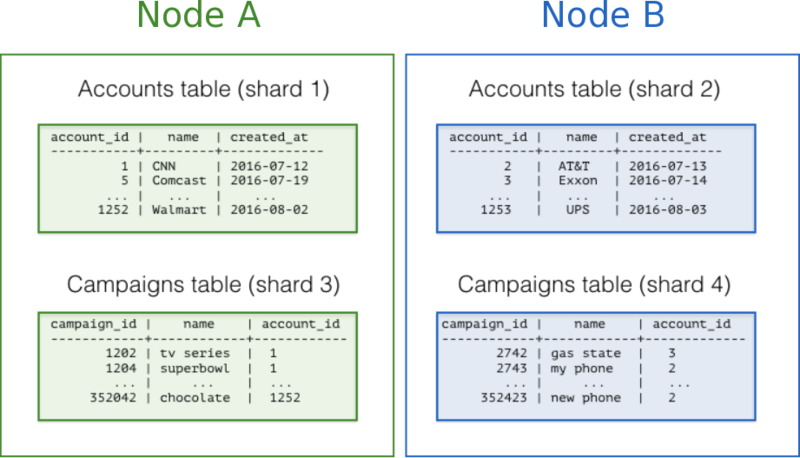 Having dozens or hundreds of tables in your database schema is also an indicator for the multi-tenant data model. The second common Citus use case is real-time analytics. The choice between the real-time and multi-tenant models depends on the needs of the application. The real-time model allows the database to ingest a large amount of incoming data and summarize it in “human real-time,” which means in less than a second. Examples include making dashboards for data from the internet of things, or from web traffic. In this use case applications want massive parallelism, coordinating hundreds of cores for fast results to numerical, statistical, or counting queries. The real-time architecture usually has few tables, often centering around a big table of device-, site- or user-events. It deals with high volume reads and writes, with relatively simple but computationally intensive lookups. If your situation resembles either of these cases then the next step is to decide how to shard your data in a Citus cluster. As explained in Architecture, Citus assigns table rows to shards according to the hashed value of the table’s distribution column. The database administrator’s choice of distribution columns needs to match the access patterns of typical queries to ensure performance. If you’re migrating an existing database to the Citus multi-tenant architecture then some of your tables may lack a column for the application-specific tenant id. You will need to add one and fill it with the correct values. This will denormalize your tables slightly. For more details and a concrete example of backfilling the tenant id, see our guide to Multi-Tenant Migration. Most SaaS applications already have the notion of tenancy built into their data model. In the following, we will look at an example schema from the online advertising space. In this example, a web advertising platform has tenants that it refers to as accounts. Each account holds and tracks advertising clicks across various campaigns. Notice how the primary and foreign keys always contain the tenant id (in this case account_id). Often this requires them to be compound keys. Enforcing key constraints is generally difficult in distributed databases. For Citus, the inclusion of the tenant id allows the database to push DML down to single nodes and successfully enforce the constraint. Queries including a tenant id enable more than just key constraints. Such queries enjoy full SQL coverage in Citus, including JOINs, transactions, grouping, and aggregates. In the multi-tenant architecture, SQL queries that filter by tenant id work without modification, combining the familiarity of PostgreSQL with the power of horizontal scaling for large numbers of tenants. Let’s look at example queries that span some of these capabilities. First an analytical query to count newly arriving clicks per campaign for an arbitrary account, say account id=9700. Citus pushes this query down to the node containing tenant 9700 and executes it all in one place. Notice the tenant id is included in the join conditions. What’s more, Citus gives full ACID guarantees for single-tenant DML. The following query transactionally removes the record of a click (id = 12995) and decrements the click count cache for its associated ad. Notice we include a filter for account_id on all the statements to ensure they affect the same tenant. There is even a way to run DML statements on multiple tenants. As long as the update statement references data local to its own tenant it can be applied simultaneously to all tenants with a helper UDF called master_modify_multiple_shards. Here is an example of modifying all image urls to use secure connections. While the multi-tenant architecture introduces a hierarchical structure and uses data co-location to parallelize queries between tenants, real-time architectures depend on specific distribution properties of their data to achieve highly parallel processing. We use “entity id” as a term for distribution columns in the real-time model, as opposed to tenant ids in the multi-tenant model. Typical entites are users, hosts, or devices. 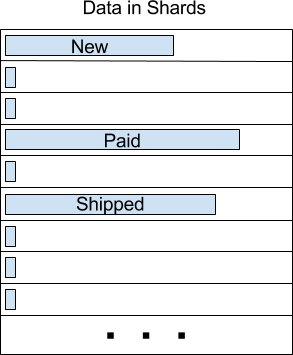 Real-time queries typically ask for numeric aggregates grouped by date or category. Citus sends these queries to each shard for partial results and assembles the final answer on the coordinator node. Queries run fastest when as many nodes contribute as possible, and when no individual node bottlenecks. Of columns having high cardinality, it is good additionally to choose those that are frequently used in group-by clauses or as join keys. Distributing by join keys co-locates the joined tables and greatly improves join speed. Real-time schemas usually have few tables, and are generally centered around a big table of quantitative events. In this scenario we ingest high volume sensor measurement events into a single table and distribute it across Citus by the device_id of the sensor. Every time the sensor makes a measurement we save that as a single event row with measurement details in a jsonb column for flexibility. To take advantage of massive parallelism we can run a cross-shard query. For instance, we can find the min, max, and average temperatures per minute across all sensors in the last ten minutes (assuming the json payload includes a temp value). We can scale this query to any number of devices by adding worker nodes to the Citus cluster. Behavioral analytics seeks to understand users, from the website/product features they use to how they progress through funnels, to the effectiveness of marketing campaigns. Doing analysis tends to involve unforeseen factors which are uncovered by iterative experiments. It is hard to know initially what information about user activity will be relevant to future experiments, so analysts generally try to record everything they can. Using a distributed database like Citus allows them to query the accumulated data flexibly and quickly. These tables can be populated by the Wikipedia API, and we can distribute them in Citus by the editor column. Notice that this is a text column. Citus’ hash distribution uses PostgreSQL hashing which supports a number of data types. A co-located JOIN between editors and changes allows aggregates not only by editor, but by properties of an editor. For instance we can count the difference between the number of newly created pages by bot vs human. The grouping and counting is performed on worker nodes in parallel and the final results are merged on the coordinator node. We’ve already seen how every row in a distributed table is stored on a shard. However for small tables there is a trick to achieve a kind of universal co-location. We can choose to place all its rows into a single shard but replicate that shard to every worker node. It introduces storage and update costs of course, but this can be more than counterbalanced by the performance gains of read queries. We call tables replicated to all nodes reference tables. They usually provide metadata about items in a larger table and are reminiscent of what data warehousing calls dimension tables.